Who does not LOVE emojis? This design uses two different densities of our 3D Emoji background. We used the denser pattern on the top and bottom AND we used a light yellow for our background color. In the middle, we changed the density and made the background color white. We then chose a simple round label and a graphic & text personalizaton style. We chose on of the emoji's for our graphic and a name for our text. There are so many ways to customize this design. 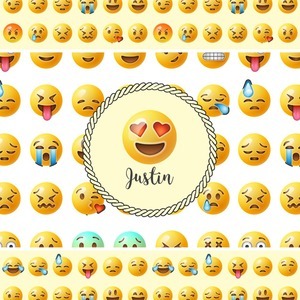 We have numerous other emoji patterns in our system, including a make your own emoji pattern with one or three different emojis! (make these changes in advanced mode) You can change the density, as well as the background color. You can change your personalization style; for your graphic we have all the different emojis in our system - so change it your favorite. You can also upload your own emoji! If you need any assistance or have a specific emoji in mind, please contact us and our graphic designers will gladly assist you.